Threesomes, treachery, and gut-turning violence – starring in the global hit series Vikings, Marco Ilsø has, as the Viking Hvitserk, done it all. However, in the real world, the young mellow Dane is all but unscrupulous. Talking to Scan Magazine, he reveals that he struggles to say no to fans and was terrified on his first day on the set of Vikings. There has been a lot to adapt to for Ilsø since he took on the role as one of the five Viking brothers in Michael Hirst’s historic hit series Vikings. Being met with cries of “yeah, slaughter those Saxons!” when grocery shopping off set in Ireland is one of them. Not being able to tell friends and family where he went for the first three months of filming was another. “There’s a lot of secrecy around the series, so when I first got the role I wasn’t allowed to tell anyone. As I was going to Ireland to film for three months, I had to tell everyone that I was just taking a bit of time off to go travelling – I think a lot of people thought that was a bit weird,” says the 23-year-old and laughs. Sat in a hotel room in Dublin, the laughter immediately washes away any resemblance to Hvitserk, Ilsø’s inscrutable Viking alter ego. The character is nonetheless what most people recognise Ilsø for and, one must presume, why he is regularly being encouraged to “slaughter those Saxons”. 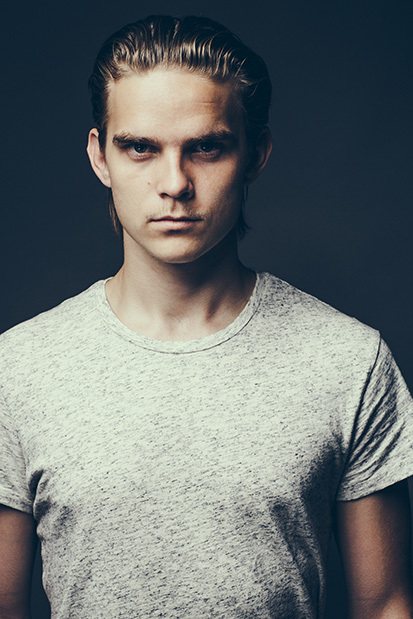 Getting his first acting job as the lead character in a Danish TV series at age 14, Ilsø was initially not too impressed with the life of an actor. “Having to go to school during the day and then film afterwards, it was a bit much, and at that age, I actually wasn’t too keen on it,” he admits. However, the directors liked Ilsø and his self-taught acting style, which, he says himself, is not really acting but just “saying the sentences the way he would in real life”. In the following years, he appeared in several roles in Danish film and TV, but he readily admits that stepping onto the set of Vikings was the biggest and most nerve-rattling moment of his career. “I was terrified! More terrified than I’ve ever been before,” he says. When asked if he had any specific tools he used to overcome the initial nervousness, his reply is, however, more in the spirit of his Viking alter ego. “No, I don’t really have any techniques as such, I just throw myself into it and get on with it,” he shrugs. Despite being initially intimidated by the scale of the project, Ilsø quickly went on to feel right at home in the company of the world-famous Vikings stars, including Katehryn Winnick (Lagertha), Travis Rimmel (Ragnar) and Clive Standen (Rollo). “The best thing about being on the show is definitely the people; we have a lot of fun. Everyone hangs out together – actors and production staff alike. I think that’s very nice; it’s like one big family,” says the young Dane. The two friends both auditioned for a number of different roles and it was not until several months and auditions later that they found out they had, between them, landed two of the series’ biggest roles. The news of which, says Ilsø, left him “a bit out of it”. While Vikings has been confirmed for another season and the series is still hugely popular, the brutality of the plot also means that there are no guarantees for the actors in terms of their character’s life span. At the end of the first half of season five, Hvitserk was indeed very close to losing his life. But, while Ilsø does not know – or will not reveal – his character’s fate, it is not something that keeps him up at night. “No, I don’t worry about it. I just worry about doing as well as I can with the stuff that they give me. So if Hvitserk was to die, I would just want to make it an amazing death,” he says. In September 2018, Ilsø will also be back on Danish TV screens in the drama series Kriger (Warrior). A modern-day drama show about war veterans, Kriger and Ilsø’s role explore some serious stories and issues. This is no coincidence as Ilsø is, he says, guided by the potentials of the role and story rather than its size or exposure. So, while he no longer has any doubts that his future lies in acting, he is not necessarily seeking the most star-studded path. “I think if you just take on everything that comes your way, you might end up being really wellknown, but that’s not my goal. I want to be the best actor I can be, not necessarily the most famous,” he says.